Posted: Mon 06 Dec, 2004 7:36 pm Post subject: Body armor types...? While I think everyone is familiar with Mail (also referred to as Chain or Ring Mail), as well as Plate Armor, there are times I don't hear much about or know much about. Scale Armor, make out small, think plates of iron, bronze or brass, that overlap each other both vertically and horizontally, reinforcing each other. Lamellar Armor, small plates of metal, leather or bone/horn that are laced to each other in horizontal rows or laced to a backing in horizontal rows. Laminated Armor, something I'm not sure about. Laminated not in the modern sense, but rather meaning made from lames, small strips of metal like those that form the articulated parts on a full suit of plate armor. Would this armor be something like the Roman Locira Segmentata, or something else? Coat of Plates, now that is this? Is it related to Brigandine armor? And what is Brigandine armor? What are some other kinds of common armor from Classical to Renaissance? Lamellar armour more closely resembles scale armour than a lorica segementa. The biggest difference between scale and lamallar is that scale is attached to a backing material (cloth or leather usually), while lamellar, as I understand it, has the plates attached to one another. 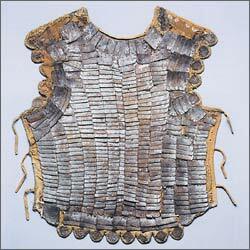 There is an SCA article on the construction of lamellar armour here. It looks fairly acurate to me, but I just skimmed the thing. 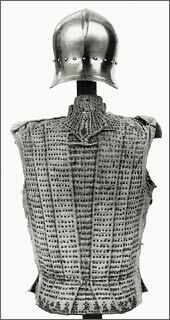 There is some pictorial evidence of what might be lamellar armour in use by Scandinavians as late as the 14th century, but I believe it was mostly used prior to that. I don't have any real firm dates, but have always seem it represented as more of a viking/migration/northern armour. I was also used by the Saracens during the crusades. A coat of plates is related to a brigandine. In fact, there is no real clear explanation of how the two differ. Generally speaking, a brigandine has small metal plates attached to a cloth or leather backing, and then lined so that the plates are not visible from either side of the garment. A coat of plates generally has larger plates (but not always), and does not generally have a lining. Of course these are modern distinctions, and I am almost certain that there are exceptions to everything I have mentioned. The main source that I am aware of for information on coats of plates is a book entitled Armour from the Battle of Wisby by Bengt Thordman, I think it is still in print. This picture is of a coat of plates, and comes from Arms and Armour of the Medieval Knight by David Edge and John Miles Paddock. Good book; I recommend it, as it does a good job of dealing with armour chronological (by century), which surprisingly few other books do. The coat of plates seems to have developed in the last quarter, or so, of the 13th century, but did not gain real popularity until early in the 14th. It went out of favour in the late 1300's, but brigandines were used by archers, men-at-arms, and the like for some time after that. It is interesting that you should ask about lamellar and coats of plates in the same thread. 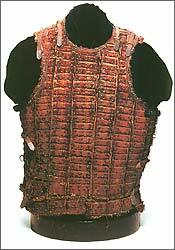 Most people do not think of them as related, but at the Wisby find, there were several coats with smaller plates that may have been old lamellar armour converted to coat of plates or brigandine fashion by putting on a leather backing. The one armour that you didn't mention is cuir bouille. That seems to have been a plate-like armour made from hardened leather. What I have read indicates that it was basically contemporary to the coat of plates. I don't know much about cuir bouille, and would love to have some more information on it. Specifically, what form did it take, how was it made, and during what era was it really used? Grey basically described the difference between a COP and a brigandine. The COP is primarily 14th century, and the brigandine appears late in the 14th century and into the 15th, and reflects the fashion of the time period. They tend to look like civilian doublets. (leather or heavy fabric) using rings. Later examples have the plates attached directly to the leather or fabric backing by rivets. Brigandine is to a degree the inheiritior/descendant of the coat of plates (which in turn was decended from the armoured surcoat of the early 13th century) . While both existed at the same time for a number of decades during the 14th century , as plate was becoming the norm for the upper(noble) classes and superceeded (sp) the coat of plates ,brigandine(essentaily a small plate coat of plates) continued to be used by the average/liveried soldier into the 16th century . Actually my reference to Lamellar armor was more of a statement then a question. Armor of this type, using a Linothorax as a backing (as well as one covered in scales) was known to the Greeks and Greek influenced cultures before the ascention of Rome. This probably grew out of the tendency to reinforce the Linothorax with 'belt' of bronze scales or small plates around the mid-section. I have also read recently that 'Crusader Era' Byzantine heavy cavalry used iron lamellar armor on a backing of leather (but according to the author no one had ever used a backing before, only lacing the plates together). It is more than likely both Coat of Plates and Brigandine develop out of this. I understand that lorica segementa (more of a segmented plate armor) and lamellar armor is different, I was just wondering about what some refer to as 'laminated' armor. From what I have read it means the articulated pieces of some plate armor made flexible by using small bands of metal strapped together. Some Legionary reactors have gone even farther in referring to lorica segementa as 'laminated'. Both the terms 'lamellar' and 'laminated' come from the same source and are essentially interchangeable, so I'm personally not going to debate this. Linothorax being of Greek origin, made out of glueing several layers of linen together to from a rigid corslet. An alternative to this is quilting the layers together, making a lighter, however less durable corslet. 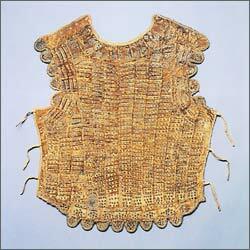 The Linothorax was a cheaper alternative to the Bronze 'Muscled' cuirass. What about various types of hide or leather armors, or armor made of different matterals? That brig is just as you say - gorgeous! I often hear/read of later period brigandine being described as following the fashion of the time, but at best I have seen very, very passing similarities in both reproduction pieces and photographed originals. The harness you photographed is what I picture in my head when one describes "following fashion".
. . . you don't happen to have a picture or two of the INSIDE of that brig, do you?
. . . I know I'm asking for the world here, but ya gotta try, right? A couple more pics of the exterior would be great too! You have a good point about the Greeks using lamellar. I had overlooked that. My experience with what people call "laminated" tends to be that they are refering to the "lames" (i.e. moving plates) on knee, elbow, and shoulder defenses, as you pointed out. That might still be a valid way of describing a lorica segmenta, but I have never encountered it. I don't know if that really answers your question or not, sorry. As far as alternative-material (i.e. non-ferous) armour is concerned, the linothorax, cuir bouille, and the simple use of a gambeson without any other armour are the only ones I am familiar with. That is what prompted me to ask about further information on cuir bouille. Afraid that's the only pic I have of it. There's got to be SOMEONE on these forums who lives near the Met that can get a couple more pics, right? I definately don't have an inside pic, as it's displayed in such a way that you can't really see inside. What I do have, though, is a pattern that I got off of one of the armor boards some time ago that gives a good idea of how one is put together. I have no idea how accurate it is, but it at least gives a good approximation if it's not perfect. One a few replica sites I have seen formed leather muscled cuirasses and describe it as 'commonly' used by the Greeks and Romans, but I can't find any historic references to this. They might have been worn for officers of the Imperial army, however most of the books I have read either consentrate on the 'citizen Hoplite' or Roman Miles Gregarius. Some later Auxilaries wore a soft leather tunic over their mail. Some replica sites have gone as far as to make harden leather lorica segmenta, saying it 'must' have existed. I believe the 'cuir bouille' you are referring to is this harded leather. What other kinds of armor were made of hide or leather? And reinforce as not yet discribed above? I don't know if it's accurate or not but I have seen drawings of an African "knight" in quilted armor and carrying a long bladed lance on horseback. At first it seamed kind of odd, but after considering, it might actually have been effective. The armor which was more like a full coverage armong coat, would definately provide more protection than being close to naked . I'll see if I can scan the pic and post it. Front and back views of a brigandine, Italy (? ), circa 1500-25. Nate the African knight to which you refer is from the Sudan . The Sudanese also used maille and maille and plate armours as well as axes of somewhat European form and a type of sword called a kaskara which looks somewhat like a bit of a stylised European medieval sword . Some of these were made from European blades ( a few as old as the middle ages) and some of the nicer ones are quit attractive. Several Northern African countries used equipment like this until almost the end of the 19th century and the "belief" is that this sort of equipment was adopted due to exposure to crusaders moving through the area. Classifying different types of armour depends entirely upon the agreed definitions of such armours. Scale is usually defined as small plates attached to some sort of backing in horizontal rows. The plates can either be aligned vertically or staggered and they can overlap in either direction but downwards is most common. Lamellar is defined as small plates laced or wired together in such a fashion that a backing material is not needed to maintain structural integrity. Some simplify this to say that if it has a backing then it isn't lamellar. Based on these definitions the Greek linothorax was reinforced with scale not lamellar. In fact I can't find a single example of true lamellar in Europe or the Near East dating before around the 3rd century AD. All earlier examples of so-called lamellar have turned out to be "locking scale" - i.e. scale armour that is reinforced by lacing or wire joining neighbouring plates together. There are examples of true lamellar in China before this time however. The earliest extant example dates to the Warring States period and consists of twelve suits of lacquered lamellar found in a tomb at Suixian. I don't know when true lamellar first appears on the Central Asian Steppes but would guess that it was around the same time or even a little earlier than the Chinese stuff. Regarding brigandine. It does not have an inner liner. It consists of a foundation garment to which the plates are attached and a cover over the top (often of expensive material). The bare plates rest against whatever arming doublet was worn underneath. 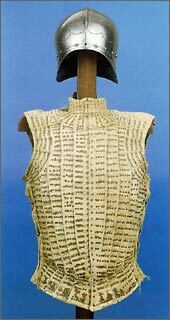 Brigandines were tailored to fit the contours of the body while the COP shows little evidence of tailoring. That brig pattern is one of those I am most familiar with; I've seen the pattern before and I've seen some reproductions made based off of it. It's the curves and organic shape of the piece pictured from the met that intrigue me. The pattern makes a very nice harness, don't get me wrong, but there's just something that feels a little off about it. . . even the pics of the pieces Nathan posted seem to have more of an angular look to them. Part of what bothers me about the patterned piece is that the skirt is too full and pronounced, and the fastening system seems out of place. If I had to speculate, it makes me think that someone involved in SCA took a coat of plates design, added conventions for use in sport combat, and extrapolated what such a piece would be like freshened up for the 15th century. Just my thoughts; I may very well be wrong. and thanks for the pics, Nathan! Regarding brigandine. It does not have an inner liner. I had always been led to believe that it did, but as the above pictures bear out that this is untrue, I stand corrected. I see no reason while either a coat of plates or a brigandine could not have a liner, but they clearly did not have to. I am sorry for the unintentional misinformation. Brigandines were tailored to fit the contours of the body while the COP shows little evidence of tailoring. That is a valid point, as coats of plates are often described as being "poncho-like" garments. That seems like a somewhat arbitrary distinction, but then so does size of plates, and presence or absence of a liner. Does anybody have information on the historical use of the terms "brigandine" and "coat of plates?" I know that coat of plates (sometimes called a "pair of plates") was used during the 14th century, and I think that brigandine was a contemparary term, but I don't remember for certain. It might make a difference. I will check the books I have here, but I doubt it will be in there. If you put an inner liner on a brigandine, the action of the plates will tear it out very quickly. The term is not a modern one. It was used in contemporary inventories and manorial records. Other variants include brygandine, brygandyne, bregander, bregandere, brigandyron, brigantayle. I don't mind admitting that you are right, but what does bother me is that I have to admit first, that I was wrong, and second, that I had not even thought of that rather relevant aspect of armour construction. The really sad part is that I thought of it when I built my coat of plates, but just never managed to make the mental shift of applying it to something other than that specific project. Thanks for keeping me in check, Dan. I've been digging through my books again lately and found some interesting things unrelated to the topic I'm researching but still worth sharing. I try not to pull these books out too often and certainly try to keep them away from the scanner due to the age and rarity of the volume, but some things need exposure. Brigandine, Milan (? ), Circa 1505. That's a nice example. Good to see some pics from Churbourg. I believe all surviving examples of Ancient 'muscle cuirasses' are bronze (which makes sense, leather would just rot away), however I don't believe there is any strong evidence that leather muscle cuirasses were ever used. I think that the idea of leather cuirasses came from misinterpreting ancient representations of linen cuirasses and Roman mail cuirasses as being made of leather.